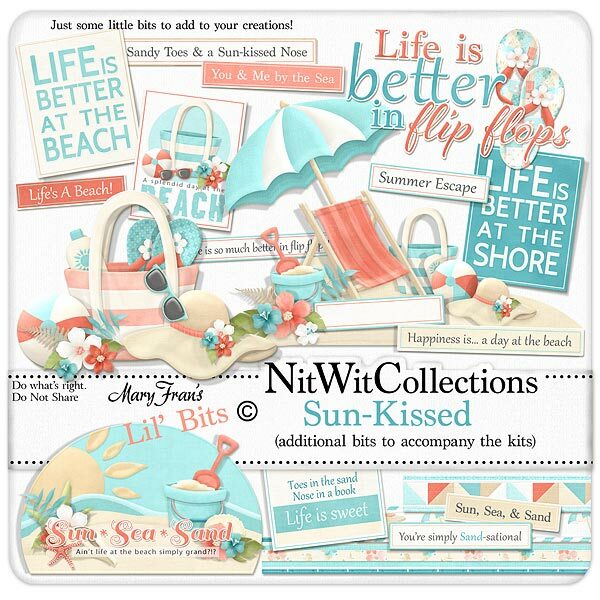 Lil' Bits "Sun-Kissed" will provide you with so many creative, pre-made digital elements to create your cards, mini albums and scrapbook layouts with!! Simply place them into your creations and see everything develop quickly so that you can go back out and enjoy the sun and create more memories !!! Don't miss out on these digital elements as they are not included in the FQB "Sun-Kissed" Collection so don't pass these by! 1 Beach scene - "Sun*Sea*Sand...."
1 Element cluster with the beach bag, beach ball and so much more! 1 Element cluster with the beach umbrella and beach chair to name a few. The quintessential beach scene! 1 Journal card - "Life is Better at the Beach"
1 Journal card - "Life is Better at the Shore"
1 Journal card - "Toes in the Sand....."
1 Journal card - "A Splendid Day at the Beach"
1 Sentiment - "Life is Better in Flip Flops"